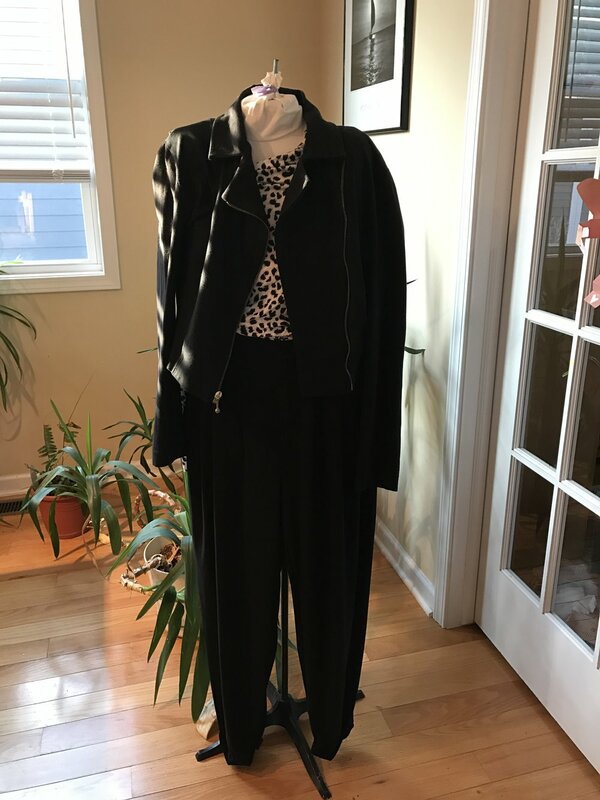 The Christine Jonson Cuff Pant Sewing Pattern is a classic pattern that Christine calls the 10lbs Thinner Pant - because it makes everyone who wears it look 10lbs thinner! We'll explore this pant pattern worn as a Jogger/Track pant in a video and in some style photos. The jogger is a snug at the waist pant with a pleated or gathered fuller hip tapering to a narrow cuffed leg (either a traditional trouser cuff - for work use - or a banded sweatshirt style cuff, for casual wear.) Joggers look amazing with a flat low boot, like a Chelsea boot, or a Vans-style sneaker or even a pointy-toe ballet flat. You can make them in a heathered knit (like a sweatpant, shown in our example) or a trouser type fabric (shown in black ITY). The pants feature no side seam, with a clever slash pocket hidden in a dart! Print joggers are also a fun addition to a casual wardrobe. We've taken the Cuff Pant and tapered the leg from 0 at the crotch to 2" narrower at the hem. Just draw a line right on your pattern with a long ruler or yardstick, putting the top of the yardstick at the crotch cut line, and then move it in at the cuff by about 2", and fold your pattern back along the line to create the narrower leg. The pant comes with a cuff - you'll want to crop this pant about 4 inches to get an above-the-ankle-bone pant (measure on yourself though, as you'll use the lengthen/shorten line to make it cropped). If you're using a casual banded cuff, you'll want to cut a cuff pattern that is your ankle circumference plus 2" x 6". This will create a 3" tall, not too snug fitting sweatshirt style cuff for the ankle. So if your ankle is 13" around, you'll cut a 15" x 6" rectangle as your pattern piece. Cut two, one for each ankle. You'll need to cut the length from the pants before you sew your knit cuff on - so try on your joggers and pin the cuff to the right spot on the pants before cutting away the excess. These are the Cuff Pant in heather oatmeal right out of the envelope, with no taper at the hem, size 16. The black ITY, size 10, are tapered 2" at the hem and cropped. Both are shown with the Cowl Neck e-pattern in a snow leopard print and either a light gray leather jacket or a black knit moto jacket. The reason these joggers work for, well, work, is that they look like a tailored trouser, with the ease and comfort of a knit jogger pant! The stretch Yoga elastic waist is snug, the pleats are crisper than gathers, and the back is smooth fitting. The trouser cuffs at the hem add work-appropriate polish. You can add some fun by using a contrast waistband and banded cuffs (for a casual look), use mixed prints (that coordinate) or a print and a solid. With the cuff: go to the office. With the banded cuff: hang out on the weekend! Fabric choice (darker/smaller print for work, and fun/brighter/sweatshirt look for weekend) makes this pant incredibly versatile. You might really need a new pair of booties (flat, short) or Vans/skateboard style sneakers to go with these pants.